“It’s a weird town” is how a customer of mine described Hastings once. I never gave much thought then, but in time their description slowly started making sense. The word ‘weird’ is actually rooted in German mythology. Once upon a time there were three sisters more like goddesses who were controlling fate and destiny, plus dressing very funky. According to the dictionary, over the time the meaning of ‘weird’ has changed and the fate and destiny part has been lost – only the funky and unusual bit remains. Nowadays no one even remembers the connection of destiny with the word weird. It is almost three years since we came to Hastings. About a year and a half had already passed before I heard Hastings described as ‘weird’. It is definitely a spot on description, but not in the way that you could have guessed. Hastings is not weird, ‘weird’. The meaning has changed again in the vicinity of Hastings. It’s gone back to its original root; it’s now about fate and destiny again – plus the unusual but completely positive. Obviously this condition is applicable in Hastings for Hastings inhabitants. It’s a beautifully weird town. Everything seems so simple when you look at it from a distance, but once you are inside it’s more complex than thermodynamic laws. It has many layers and many dimensions. Chaotic, serene, funny and very creative – that is how one could describe Hastings. All kinds of events constantly pop up all over town and no one is thinking or saying “whats going on in this town” its just another day for everybody. I guess that the best words to define Hastings are weird, wonderful and cool. If you take the train away from town to London – for instance; as soon as you leave St Leonards, a cloud of sadness appears. It’s invisible, but one can surely hear the movement of the sad cloud. That cloud never leaves until you get back; it also starts talking to you as you get out of the train. It whispers to you “welcome back home”. Even foreigners such as me are affected by the weird and wonderful atmosphere of the town after a while. In fact I might have met one of the three goddesses of German mythology. She had such deep, beautiful blue eyes that when I looked at her I felt totally drowned as if I was diving towards the deep of the Marianna trenches. Long live weird and wonderful Hastings. Cafe Grand Rue de Pera is at 73–74 Queens Road, opposite Morrison’s petrol station. Barbaros makes delicious coffee and provides an environment perfect for talking about everything, from the mundane to the weird and wonderful. If you run out of conversation, an eclectic selection of books are available to inspire your thoughts. 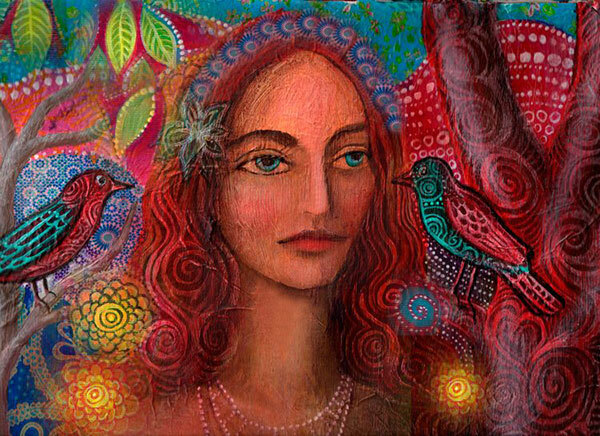 Alice Mason’s beautiful paintings of goddesses and other things can be seen on her Facebook page and original paintings and prints are for sale in her Etsy shop.